Bookride: Dow Mossman. The Stones of Summer, 1972. Dow Mossman. THE STONES OF SUMMER. Bobbs-Merrill, NY, 1972. "Dow Mossman was born in Cedar Rapids, Iowa...studied at Coe College for two years, finished college at the University of Iowa and received his M.A. from the Iowa Writers' Workshop in 1969. His novel, The Stones of Summer, was published by Bobbs-Merrill and Popular Library in 1972. Following the publication of The Stones of Summer, Dow was mentally exhausted and spent several months in an Iowa sanitorium. The novel soon went out of print... Stone Reader chronicled the director's attempt to resuscitate the acclaimed book and speak to its seemingly-vanished author. The film shows Mossman currently living in the family home, which is filled with books. According to the film, Mossman writes on the porch, and is currently working on a book based on notes he has taken from hundreds of old movies. Mossman lists the memoirs of Casanova as his favorite literary work. As a child, Dow read the Bible, and the complete novels of Arthur Conan Doyle...Mossman occasionally plays snooker at a local taproom and never misses a sale at the Cedar Rapids Library, which has provided him with reading treasures such as several years of bound Century Magazines from the 1890s, and an 1867 translation of Don Quixote which he feels captures Cervantes better than any other. Mossman is an avid Chicago Cubs fan and rides a motorcycle. Prior to Stone Reader, Dow had been employed for 19 years as welder. He subsequently quit to look after his aging mother, who later died, after which he returned to work as a paper bundler for the local newspaper. 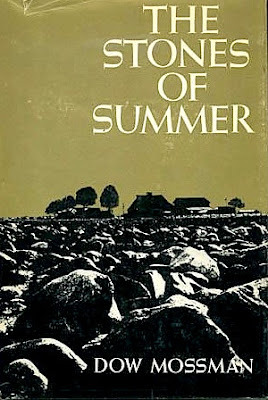 After the film's release, The Stones of Summer was re-published. He is now semi-retired." Here for your delectation is the SPECTACULAR & RARE-------THE STONES OF SUMMER by Dow Mossman.THIS IS ONE OF THE RAREST BOOKS TO BE FOUND ON THE INTERNET!! !---or anywhere else! ... Earning its author comparisons to no less than James Joyce, J. D. Salinger, and Mark Twain, this great American novel developed a passionate cult following -- the pages and binding are tight as a drum... bid soon and often for this magnificent, impossible-to-find LITERARY COLLECTIBLE.